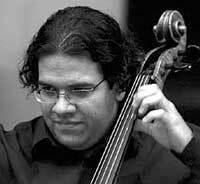 Diego Garcia came to the United States from Colombia, a recognized cellist at a very young age. He received his Bachelor's Degree in Performance from the Manhattan School of Music and a conducting fellowship to the Conductor's Institute at Bard College. Throughout he has performed and conducted widely nationally and internationally. Mr Garcia is currently serving as Music Director of the Eastman String Fellowship Orchestra, in Rochester New York. Working from edited video, Diego Garcia composed, arranged and conducted the original music score for the club scene of The Heart Of Tango. 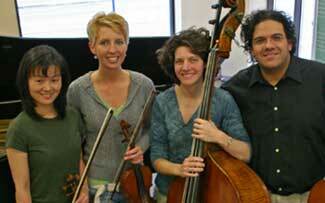 Members of Quartsemble performed the music for Heart of Tango. Founded in 2002 by Diego Garcia and his wife Karine Stone, Quartsemble is an innovative chamber music ensemble based in Rochester, New York and dedicated to performing classical masterpieces side by side with Latin music and more contemporary repertoire. Violinist, An-Chi "Angel" OuYang, holds a Bachelor of Music degree from Soochow University in Taipei and a Master of Music degree in Violin Performance and Literature from the Eastman School of Music. Angel is on the faculty of the Hochstein School of Music and teaches privately. Bassist, Gaelen McCormick, a member of the Rochester Philharmonic Orchestra, with many years of chamber and symphony orchestra performances. She is an alum of the Eastman School of music and Carnegie Mellon University.